Trump lashed out on Twitter a day after three women who previously accused him of sexual harassment shared their stories on NBC’s Megyn Kelly Today. Jessica Leeds, Samantha Holvey and Rachel Crooks on Monday also urged Congress to investigate Trump’s behaviour. In the wake of accusations of sexual misconduct and harassment directed at powerful men in the media, Hollywood and corporate America, Gillibrand has been among those leading the push for more accountability on Capitol Hill, regardless of party affiliation. As a result of the climate of heightened awareness, Democratic congressman John Conyers and Senator Al Franken will be leaving office in the wake of allegations of improper conduct toward women, as is Republican congressman Trent Franks. Republican congressman Blake Farenthold of Texas, who hasn’t stepped down despite a confirmed payout of $ 84,000 US to settle a sexual harassment lawsuit, will be subject to a House of Representatives’ ethics committee hearings. Several Democrats took Trump to task for the wording and suggestiveness of Tuesday’s tweet. The phrase “she persisted” went viral earlier this year after Senate Majority Leader Mitch McConnell silenced Warren as she tried to read a letter from Coretta Scott King about then-attorney general nominee Jeff Sessions. 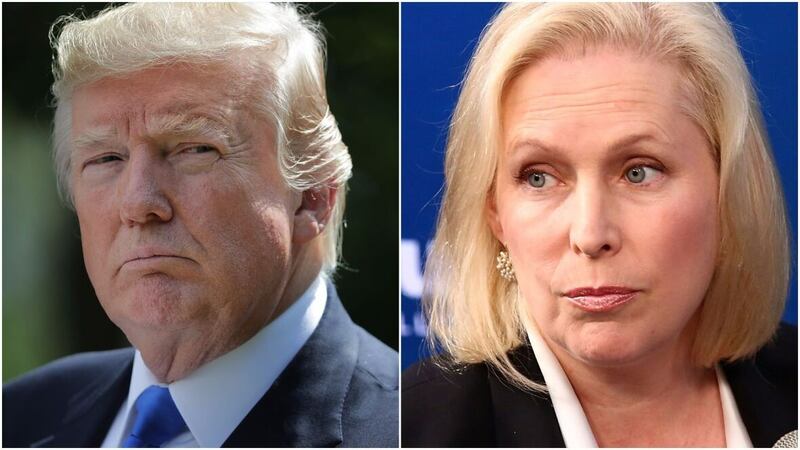 Trump donated $ 4,800 to Gillibrand’s Senate campaign in 2010, according to federal campaign finance records. On Monday, the three women — Jessica Leeds, Samantha Holvey and Rachel Crooks — urged Congress to investigate Trump’s behaviour. White House spokesperson Sarah Huckabee Sanders pledged to provide a list of eyewitnesses whose accounts exonerated the president. She did not provide the list by late Monday. Huckabee Sanders has also repeatedly said the U.S. voters decided the merits of the allegations by electing Trump president. Trump has also actively campaigned for Roy Moore, who was vying Tuesday for a seat in the Senate representing Alabama, despite historic allegations of predatory behaviour toward teen girls, including one accuser’s allegation of an attempted sexual assault. The Trump accusations surfaced during last year’s presidential campaign, but the three women raised the issue anew on Megyn Kelly Today and at a news conference. The former beauty queen claimed that Trump ogled her and other Miss USA pageant contestants in their dressing room in 2006. Crooks is a former receptionist at Trump Tower and Leeds says she met Trump on a flight. Sixteen women have come forward with a range of accusations against Trump, many after the release of the Access Hollywood tape last October in which Trump was caught on an open microphone bragging about groping women. One woman, Summer Zevos, a contestant on Trump’s reality show, The Apprentice, sued, contending that Trump’s denials of her accusations amount to false and defamatory statements.